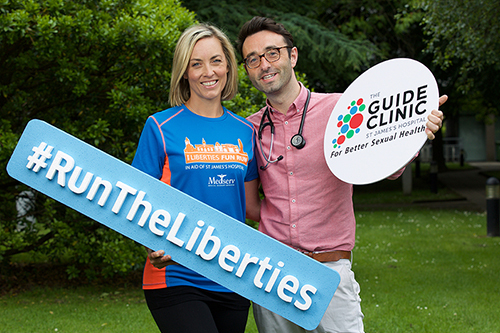 Dr. Dominic Rowley tells us about working in the GUIDe Clinic and why he is asking people to take part in this year’s Liberties Fun Run in aid of the clinic. I am a consultant in Genito Urinary Medicine. I cover all elements of sexual health including STI’s, genital skin problems, female pelvic pain, erectile dysfunction and urinary tract symptoms. A major part of my role is care of patients with HIV. Every STI is on the rise (worryingly) including HIV infections for the 1st time in many years. It wouldn’t be dramatic to say that there is an epidemic of STI’s at present. The main challenge that I see is that patients don’t stand up for their rights and shout loudly enough for their cause. There is also a challenge in terms of securing funding. On a basic level, I finished my training in Australia last year and started working at the GUIDe Clinic here at St. James’s Hospital. I was really humbled and struck by how hard the staff work in poor conditions. The working environment and patient experience does need to be improved. New toilets would be the most basic of the essential works to be done and the most instant appreciable difference to patient’s experience. The GUIDe clinic is the only speciality in St James’s Hospital that requires all patients to use the toilet where they provide intimate swabs. Funds from the Liberties Fun Run would mean that we could have hygienic, private facilities for patients.